Not to sound weird or anything, but I really wish stinking garlic and onion was socially acceptable (did I really just say that? ?). I mean, I would eat onion salad everyday and at least triple my garlic consumption. That’s how much I love them. Plus, as my father would say, raw onion and garlic has tons of health benefits. But, as you all know, we’re not at this point just yet and if you want people to stay away from you, garlic or onion breath is the way to go. Where am I going with all that? I’m not so sure myself but if you’re an onion lover like me, then you probably love leeks too. If you think about it, leeks are basically overgrown green onions, except you can only eat the white edible part (except when you’re making a soup, and then you can also add in a few green leaves too). It’s milder than onion but still has its distinctive flavor. 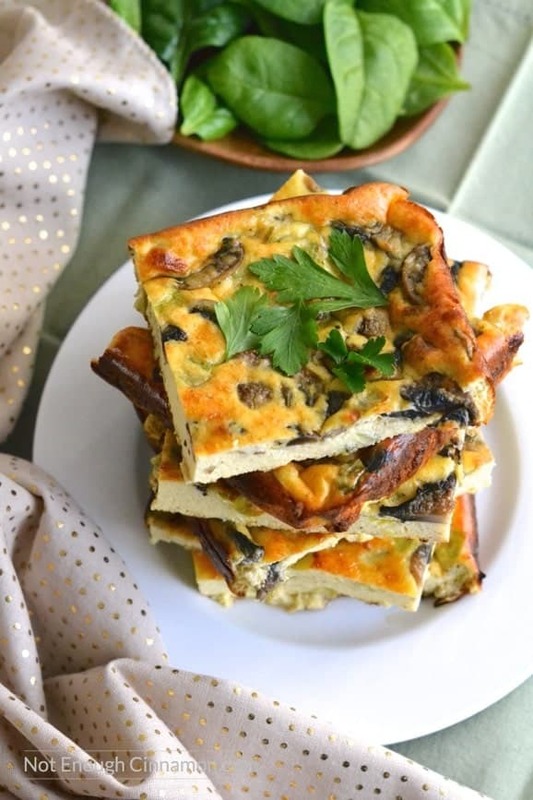 This frittata is loaded with leeks and mushrooms, and it reminds me of a classic French leek tart called Flamiche that I simply adored when I was a kid. Try this recipe first and if you like it, then I’m sure you’ll go crazy over the Flamiche aka French leek tart (you can find the recipe in my eCookbook Et Voila!). Preheat oven to 200C - 400F. Line a 9 x 13 inch (22 x 33 cm) baking pan with non-stick parchment paper (it helps to spray the baking pan with cooking spray to make the parchment paper stick to the pan). In a skillet, heat olive oil over medium heat. Add garlic and cook for 30 seconds or until fragrant. Add leeks and cook until soft, about 1 minute. Add mushrooms and cook until just soft, about 1 minute. Season with salt and pepper to taste. Spread mixture in prepared baking pan. In a large bowl, whisk together eggs, milk, ricotta, parmesan and nutmeg. Season with salt and pepper to taste (keep in mind that the cheese + leek/mushroom mixture is already salted). Pour in baking pan. Remove from the oven and allow to cool slightly. 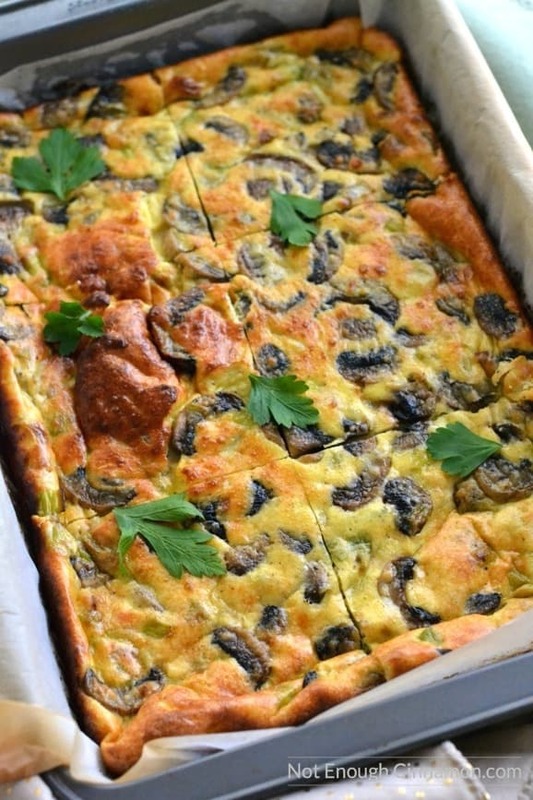 Slice frittata into 6 pieces. You can serve it warm or cold. Store in a container in the fridge if eaten cold. Wow Marie! Isn’t this so appetizing? I love it! 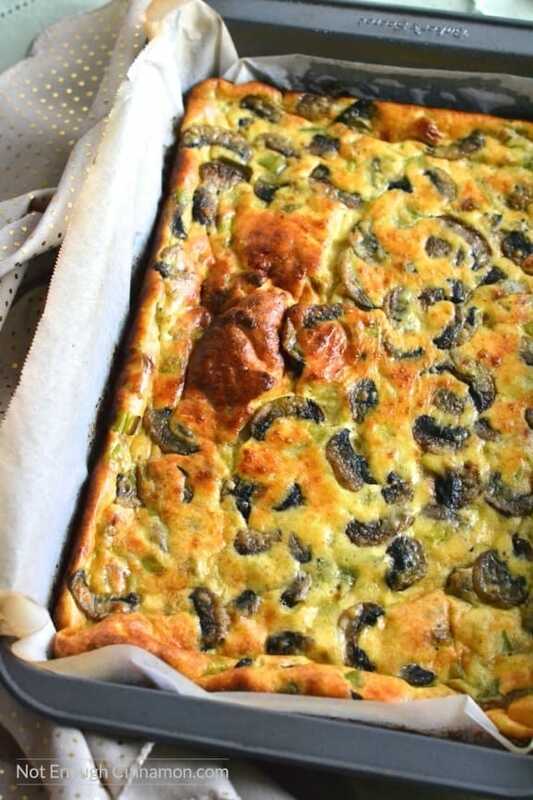 I love the combination of leek, mushroom and ricotta. Absolutely yummy!